The idea behind CORE emerged in 2013, when behavioral scientists at UC San Diego (UCSD) started to experience difficulties when navigating the IRB-review process related to pervasive imaging. In particular, researchers submitted protocols describing an observational study that involved participants wearing a Microsoft SenseCam – an outwardly facing wearable camera – coupled with a GPS location tracking device. The research objective was to observe whether wearable sensors could be used as an alternative to self-report of behavior in a free-living environment, such as what research participants were eating or what physical activity they were engaged with. The IRB reviewing this protocol struggled with establishing a risk to benefit calculus for the bystanders who may be captured in the images recorded by the SenseCam as a result of being near a research participant. Following these initial problems, we became interested in uncovering what other issues were currently hindering or slowing research involving new pervasive sensing technologies. For instance, we observed how researchers were often employing inconsistent or non-extant data storage policies to manage granular and voluminous data or were facing issues determining whether accessing publicly available social media data requires IRB review to study potentially sensitive health behaviors. We decided to develop a solution and create a new environment where (1) researchers could convene to better understand how to design research involving novel technologies; and (2) the IRB community would have access to the regulatory and ethical guidance in development, to support use of these technologies. Design Thinking workshop intermediate artefacts in the form of “How might we…” statements. Core launched in 2015 at UCSD, with the support of the Robert Wood Johnson Foundation (RWJF), and exploiting the existing relationship between RWJF and UCSD via the “Health Data Exploration” (HDE) project. 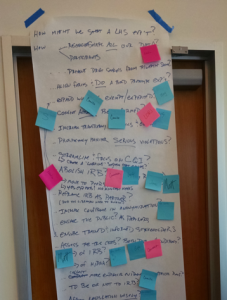 In January 2015 we convened a group of stakeholders across ubiquitous computing, social media research, human-computer interaction, research ethics, privacy law, institutional review board, and funders who were interested in exploring research ethics. Stakeholders engaged in a day-long Design Thinking workshop with the goals of “Reimaging the IRB.” Proposed solutions focused on five main action points: (i) redesign the consent forms and process, (ii) empower researchers to protect participants, (iii) support reinforcement/learning from experience, (iv) increase IRB’s efficiency, and (v) enable effective review of research that leverage technological advances. We followed up on these ideas and conveyed a number of workshops and meetings with stakeholders, including members of the IRB, researchers at UCSD, HDE conference participants, and attendees of the Public Responsibility in Medicine and Research (PRIM&R) “Advancing Ethical Research” meeting. During these encounters we wanted to maintain an authentic user-centered and participatory design process, which lead us to employ multifaceted communications strategies to regularly solicit feedback to be applied to early CORE platform prototypes. Our formative work led us to start developing what we called the CORE platform, a space where stakeholders could actually start to have a voice. Between October 2015 and June 2016 we utilized data obtained from 43 different stakeholders engaged in 86 distinct events, including 29 team meetings, four conference presentations, 45 feedback sessions on feature developments, and eight focus groups to develop the initial web infrastructure that would support the CORE initiative. The results were the three components that still define the CORE: the Q&A Forum, the Resource Library and the Network Directory. CORE Activity Process Chart showing the different types of CORE project events and development activities on a timeline. The color-coded circles in the top half of the chart represent events from three categories (conferences, focus groups & workshops, and team meetings) which correspond to the events listed in Table 1. The dialogue boxes label key events that took place over the analyzed period. 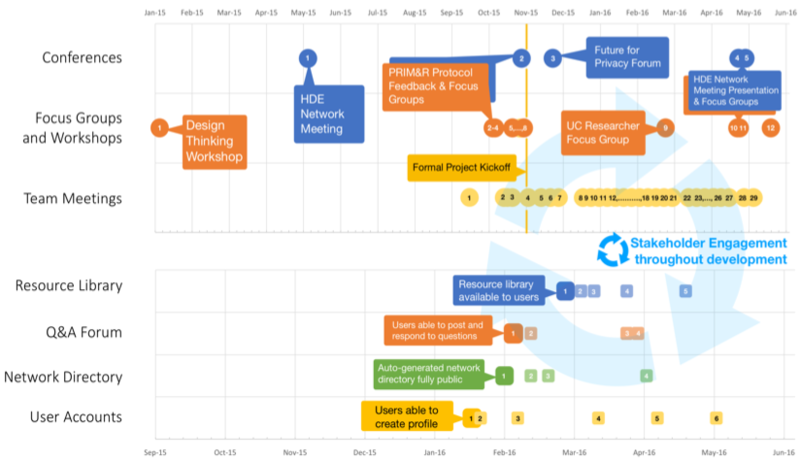 The color-coded squares in the bottom half of the chart represent specific development activities and feature-implementation milestones from four categories (user accounts, resource library, forum, and network directory). Team meetings were the most common feedback events and many resulted in important developments. Focus groups and conference presentations informed subsequent discussion in meetings. Overall, we see how frequent participant feedback from various types of events informed the implementation of features across the four dimension of development activity. With the main features of the CORE platform developed, we launched CORE with a new website in Spring 2016 and we started to grow our network. We directly engaged with stakeholders across many different areas, both directly and at conference presentations, and we started to be active on social media, especially though our @COREethics Twitter account. Engagement efforts resulted in 450+ followers on Twitter, 550 network members, 220 forum posts, and 134 resources uploaded into our library (June 2018). Today, we are more active than ever, and eager to grow even more, and we welcome the participation of new network members, the upload of new resources, and more questions in our Q&A forums. We are particularly excited to introduce in this coming months a new array of smart features that will make our member automatically locate interesting resources and posts, as well as facilitate answering questions and connect with other members.